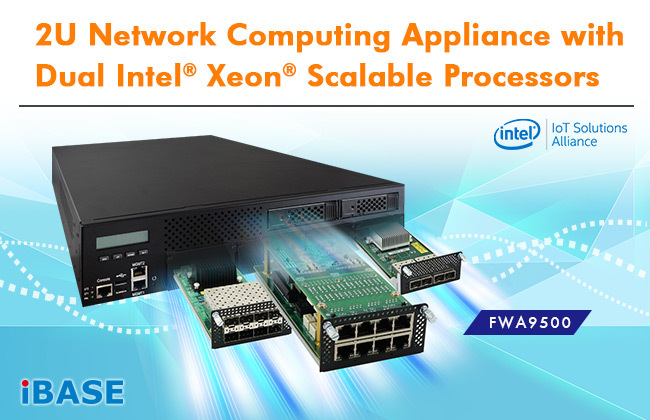 Taipei, Taiwan, January 23, 2019 - IBASE Technology Inc. (TPEx: 8050), a leader in the manufacture of network appliances and embedded systems, has launched its highly-flexible FWA9500 network computing appliance supporting Intel® Skylake-SP Xeon® processors for today’s ever-changing network environments. The 2U rackmount system features dual LGA3647 CPU sockets and the Intel C624 chipset that supports up to 512GB RDIMM memory in 16x DDR4-2666 sockets. With two Intel I210-AT Gigabit Ethernet controllers on board and configurable NIC module slots, it can be equipped with 8x IBN (IBASE proprietary network interface) cards to accommodate a maximum of 66 GbE ports. IBASE Technology (TPEx: 8050) specializes in the design and manufacturing of robust industrial PC products, delivering high quality products and excellent service since its establishment in 2000. IBASE carries out manufacturing and quality control at its own facilities in Taiwan that are certified with ISO 9001, ISO 13485 and ISO 14001 standards. Current product offerings comprise of x86- and RISC-based industrial motherboards, embedded systems, panel PCs, digital signage players and network appliances for applications in the automation, retail, transportation, gaming, healthcare and smart factory sectors. For more information, please visitwww.ibase.com.tw.